Submitted Photo Albert Baillis is given an honorary degree. The 113th annual law commencement was held at Ohio Northern University for 79 graduating students. A long-time professor received an honorary degree at Ohio Northern University on May 17. 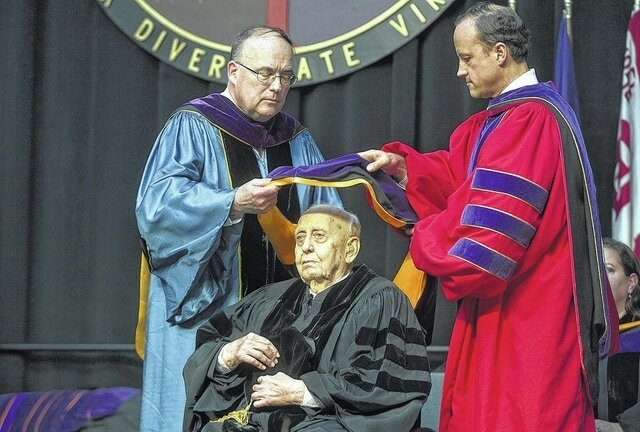 ONU’s Pettit College of Law awarded the degree to long-time law faculty member Albert Baillis, who fought with distinction in Italy, France and Germany during World War II. After the war, Baillis received degrees from Case Western Reserve and went on to hold other various positions. Baillis joined the law faculty at the university in 1957 and became a law professor in 1962. FINDLAY — Three student groups with the University of Findlay will showcase their experiences of intercultural projects in the community through informal poster presentations. The “Intercultural Showcase” will be held from 2:30 to 4 p.m. Sunday in the Alumni Memorial Union’s multipurpose room. The Business Enterprise Center at Wright State University’s Lake Campus has helped many businesses through the years with free business consultations. The program will offer non-credit courses to anyone interested throughout the month of June. For information, call the Wright State University-Lake Campus Business Enterprise Center at 419-586-0355 or email rachel.stoker@wright.edu. A long-time art teacher and Findlay native, Nancy Ludi Frankenfield, will showcase her pieces of art at the University of Findlay. The gallery hours are 8 a.m. to 8 p.m. every day until Friday at the University of Findlay’s Dudley and Mary Marks Lea Gallery, in the Virginia B. Gardner Fine Arts Pavilion. The University of Northwestern Ohio will hold its annual graduation ceremony at 1 p.m. June 14 at the Veterans Memorial Civic and Convention Center. A total of 1,274 students will receive their diplomas. The Cadets, a drum and bugle corps, will perform at 8 p.m. June 14 at the Ohio Nothern University’s Dial-Roberson Stadium. The event is free and open to the public. Visitors should park at Wander Field because of construction on Klingler Road. Online classes only, the Apollo Career Center Summer School courses are flexible and rely on personal student motivation. Students are responsible for having all work for the class completed by midnight July 15. Orientation is mandatory for prospective students. For information, call 419-998-2921. Six students attending the Blanchard Valley Health Foundation recieved scholarships for their programs. Ashley Mathias received the Phyllis Zimber Endowed Scholarship and the Karis S. (Powell) Woodward RN Nursing Scholarship; Corrine Heflinger received the Kathleen Higgins Nursing Scholarship; Jennifer Jacoby earned the Sherri Winegardner Endowed Nursing Scholarship; Emilie Scarbrough and LuAnn Pever each earned the Maxine Snyder Endowment Trust Certification and Masters Preparation Scholarship. Scarbrough also received the Kristine Mullen, RN, Memorial Scholarship; Shannon Kohls received the Karen Jones Nursing Certification Scholarship. To be inducted into the honor societies, students must have a GPA of 3.5 or higher after completing at at least 18 credit hours of college coursework. Those indicted into Phi Theta Kappa include Thelithia Banks, of Lima, and Chris Baden, of Continental. Names of those who are graduating from Bowling Green State University and those on dean’s list for the 2014-2015 school year can be found on the school’s website at http://bit.ly/1Ii5RJd. Bluffton University: Jenna Graham and Aimee Lugibihl, of Gomer; Nathan Evans, of Harrod; Mary Bias, Scot Ciminillo, Monica Donley, Janel L. Engberg, Julie Foster, David Henderson, Meghan Hirn, Amy Hopkins, Mary Huffman, Ryan Laidlaw, Melissa S. Makley, Lindsay N. McDonald, Zachary Rumbaugh, Jay Simpson, April Sroufe, Meghan Taucher, Luke Taviano, Tosha Watson, Michelle Williams, Stacy Wolfe, Joshua Young and Rileigh Zickafoose, all of Lima. University of Findlay: Aaron Adams, of Saint Marys; Kendra Averesch, of Leipsic; Jenise Berning, of Minster; James Eck, of Ada; Benjamin Eiserle, of Bluffton; Erica Ellerbrock, of Ottawa; Mitchell Faine, of Bluffton; Justin Fischer, of Cloverdale; Darlene Johnston, of Ada; Kaylynn Kaeck, of Waynesfield; Lucas Kohls, of Columbus Grove; Joel Kozlesky, of Findlay; Molly Laibe, of Ottawa; Deidre Latham, of Pandora; Katlyn Laudick, of Ottawa; Sydney LeVan, of Kenton; Bethany Nye, of Bluffton; Chelsea Recker, of Fort Jennings; Chelsea Ricker, of Ottawa; Miranda Roehler, of Ridgeway; Scott Russell, of Delphos; Brent Sager, of Ottawa; Amanda Schutz, of Dunkirk; Dorothy Selhorst, of Columbus Grove; Shelby Stump, of Dola and Chelsea Wischmeyer, of Ottawa. Muskingum University: Kourtney Clayton, of Lima. Bob Jones University: Kristen Cave, of Spencerville and Joel Whited, of Lima. University of Mount Union: Chelsea Miller, of Elida, and Jacob Tremoulis, of Lima. Ohio Northern University: Trista A. Douce, Brittany P. Holland, Brandon L. Hoy, Autumn M. Klinger, Benjamin J. Neville, Morgan N. Rouch, Courtney M. Smith, Elita C. Smith and Suzanne C. Young, all of Ada; Taylor A. Roberson, of Belle Center; Rebecca R. Carman, Andrew C. Gray, Taylor R. Manahan, Whitney N. Rader and Kaitlyn E. Wilson, all of Bellefontaine; Matthew R. Deter, Whitney N. Dowell, Austin P. Lanquist, Austin P. Marquart and Stephen A. Tatarkov, all of Bluffton; Miranda K. Fiely, Charles C. Hay, Connor P. Kleman and Gage A. Magoto, all of Celina; Chelsea A. Ebert, of Cloverdale; Samantha J. Hartings, Morgan J. Homan, Lauren M. Rose, Ryan J. Siefring and Jayme R. Wright, all of Coldwater; Adam S. Bair, Erin D. Bogart, Trevor C. Guisinger, Kurt T. Meyer, Anna C. Ricker, Amber R. Walker and Randy D. Zeller, all of Columbus Grove; Michelle L. Noffsinger of Continental; Michael J. Greer, Cody S. Lovejoy and Taylor L. Wohlgamuth, all of Cridersville; Sydnie L. Fitzwater and Hannah R. Lamb, of Defiance; Grant P. Brand, Michelle D. Hitchcock, Gabrielle K. Metzner, Samantha A. Miller and Seth R. Wollenhaupt, all of Delphos; Eric J. Biedenharn and Chelsea E. Cadle, of Elida; Boston J. Ballmer, Derek S. Blubaugh, Camden C. Brown, Andrew M. Burns, Rachel L. Cruea, Nicholas J. Farwig, Phillip A. Farwig, Sarah E. Frendo, Ryan C. Geise, Caitlin M. Huber, Nichole E. Huber, Caleb M. Joseph, Joshua C. Kiesel, Jessica A. Larkey, Joshua P. Long, Rachel A. Muhlenkamp, Patrick T. Riley, Louis M. Streacker, Kent L. Wilin, Kelsi A. Wurm and Kimberly M. Young, all of Findlay; Martin T. Brenneman, Austin R. Brown, Amy E. Fox, Ashley A. Fox and Kathlyn N. Johnson, all of Forest; Cassandra R. Lindeman and Lacey A. Hittle, of Fort Jennings; Kasie L. Bellmann, of Kalida; Luke J. Creager and Brock R. Reynolds, of Leipsic; Jarrett A. Barr, Austin E. Bracy, Jeffrey R. Briley, Brittany L. Brock, Jessica M. Dunham, Grant D. Flanigan, Brandon J. Guillen, Jenna K. Hollar, Rachel L. Kerber, Colt S. Lovejoy, Abigail J. McNulty, Shane M. Naylor, Holly A. Patrick, Kourtney E. Reneau, Emily A. Runser, Shawn R. Stevens, John R. Willamowski, Jr. and Amy C. Wright, all of Lima; Claire E. Heitkamp, Jodi K. Otte and Ellis J. Pohlmann, all of Maria Stein; Sarah A. Hosey, of Mount Cory; Meagan K. Brandt, Patrick H. Keyes, Janel A. Schulte and Matthew R. Zirkle, all of New Bremen; Riley O. Alexander, of Ottawa; Taylor B. Hermiller and Dustin J. Rieman, of Pandora; Samantha L. Fortman, Alexander D. Mielke and Jeremy G. Wilson, all of St. Marys; Joseph T. Hurless, Nathan B. Knodel and Claire L. White, all of Van Wert and Countney L. Knippen, Corey W. Lotridge, Schelby K. Rosebrook and Addison C. Wolf, all of Wapakoneta.